In an interesting turn of events, my roommate was in search of a fabric for a Venetian gown and she now has the other 8 yards of this fabric from my stash. I’m looking foward to showing off both my Florentine inspired gown and her Venetian gown when they are completed. She is close to done with her bodice and has started her skirt. The interesting thing to note is that I am using the damask inside out and upside down from how it will be used in her gown! We will be the upside-down-inside-out twins. 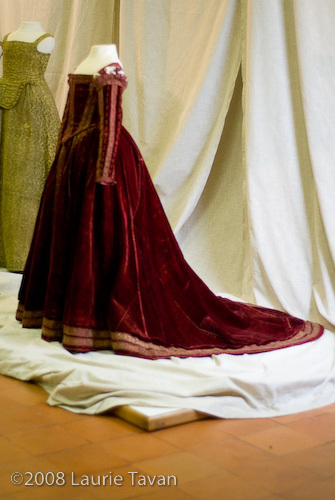 I first decided to shorten the train a bit and to not do an actual reproduction of the Pisa gown (although I have a feeling I’ll be tempted to get red velvet soon anyway….). 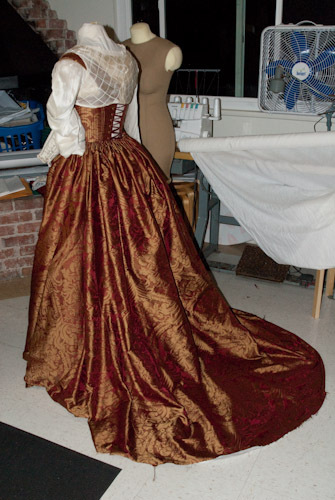 I already had a petticoat and pair of bodies ready to go under such a gown so I decided to use the same damask for the gown but add in a split front skirt using the basic patterning to develop similar style lines. Because I am using a heavily patterned fabric I also decided to show it off by having the center front flat instead of pleated for the first few inches. This helps to show off the pattern matching at the center front split. I’ll have to get a good photo of that once I have it back on my form. This means more of the pleating of the skirt is shifted backwards and gives a more full pleating at the side than in the Pisa gown. I was tempted to take out some fabric but decided I liked how it looked once I had it pinned up on my form. I really like how the gussets drape as well as produce a very generous hemline to waist ratio of fabric. The amount at the waistline still provides enough fabric for cartridge pleating but is less bulky than if I made the skirt out of three straight panels of fabric. 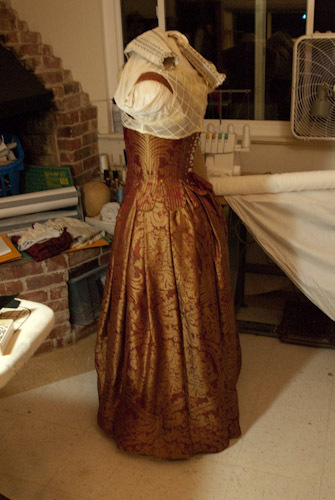 My first instinct was to actually attach the skirt to the gown bodice. But I know I’ll want to take of the trained skirt for some events so to make the outfit more functional I’ll probably attach the skirt to a separate waistband. This would allow the single bodice to be worn with the matching petticoat alone and still work as a functional Italian gown. I’m torn about this decision but due to a limited amount of fabric I think making a separate petticoat bodice and gown bodice for each skirt will be out of the question. That is if I want to have sleeves, and I do. Any progress on the Pisa gown? Did you make it in red velvet? Iâ€™m using something like it in a fiction story, and any new photos would be much appreciated! Yes I finished the gown! I have yet to start one in velvet :( Thank you for your interest ;) If you click on R&G trained gown it should show all posts related to the gown. Absolutely gorgeous gown!! If you don’t mind me asking, how wide were your skirt panels (before pleating) and how many panels did you use? 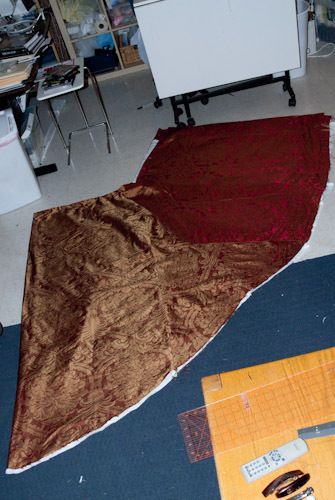 I am currently making a Florentine gown myself, and have no idea how much fabric to use for the skirt. The fullness of your skirt is PERFECT! Oh my I just saw this comment, I’m unsure but I could try to measure next time I get the gown out of storage. Hope your project went well!